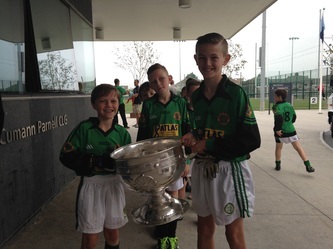 Cuireadh foireann peile na scoile ar bun don chéad uair sa bhliain 2011. Go luath sa bhliain sin d'oibrigh Niall Ó hÉineacháin go crua chun urraíochta a eagrú le geansaithe a chur ar fáil don pheil. Bhí an t-ádh orainn cuidiú a fháil ó David Stokes, a bhí ag obair le comhlacht áitiúil, Atlas Tyres, agus a chuir airgead ar fáil le na geansaithe nua a cheannach. Fuaireamar na geansaithe le suaitheantas na scoile orthu go gearr ina dhiaidh sin agus bhí na páistí réidh le imirt ar son na scoile. Chuireamar foireann buachaillí isteach i gcomórtas Chumann na mBunscol i mí Mheán Fómhair na bliana sin agus bhain siad an-sult as a bheith ag imirt in éadan na scoileanna eile. Faoin am seo bhí Múinteoir Pádraig ar bord ag cuidiú le Niall agus bhí cúil iniompartha ceannaithe ag an scoil sa dóigh is go mbeadh na buachaillí ábalta cluiche a imirt 'sa bhaile'. 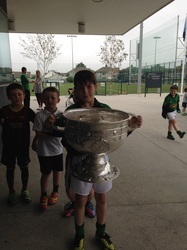 Chomh maith le bheith páirteach i gCumann na mBunscol, d'imir muid cúpla cluiche cairdiúil leis na scoileanna thart timpeall orainn agus bhí an spórt agus spraoi ag na páistí a ghlac páirt. An bhliain dar gcionn ghlac Pádraig anonn ceannasaíocht na foirne agus cuireadh foireann cailíní ar bun don chéad uair. 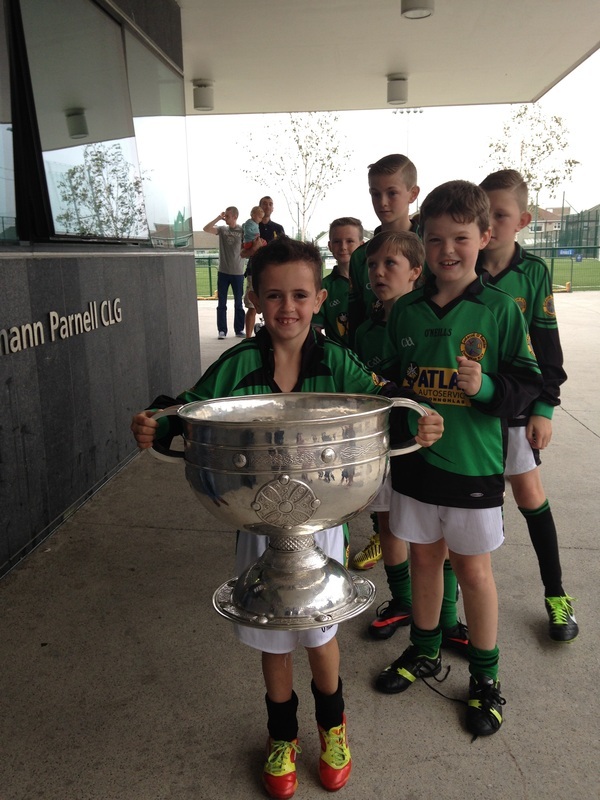 Bhí dhá fhoireann ag an scoil i gcomórtas chumann na mBunscol anois agus an pheil ag dul ó neart go neart. Chuir muid isteach ar na Go Games agus an Corn gach bliain ina dhiadh sin agus ghlac múinteoir Richard agus múinteoir Alison ceannasaíocht ar an dá fhoireann agus tá siad ag dul ó neart go neart ó shin. The school team was first formed in 2011. Early that year Niall Ó h-Éineacháin worked hard on securing sponsorship in order to supply jerseys for the team. We were greatful that David Stokes, who worked locally with Atlas Tyres at the time kindly put up the money so that we could buy the jerseys. 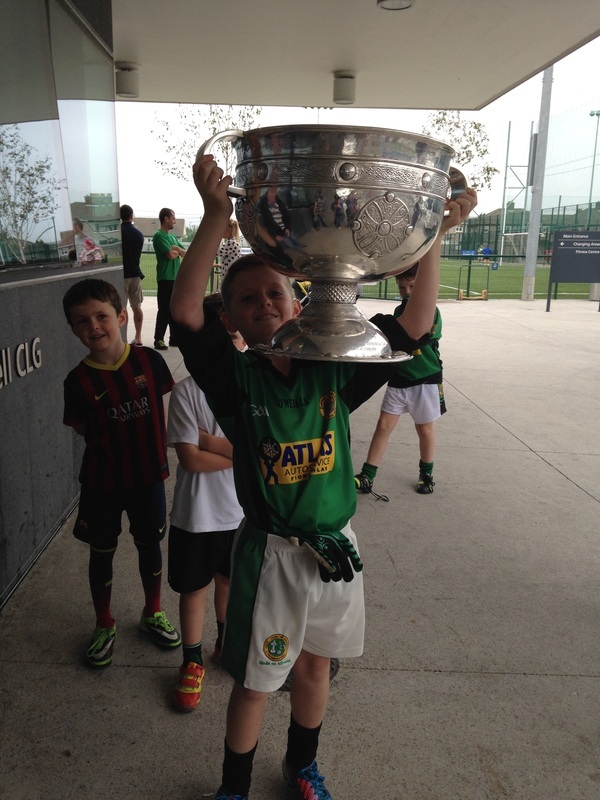 The jerseys with the school name and crest arrived shortly afterwards and the children were all set to play. 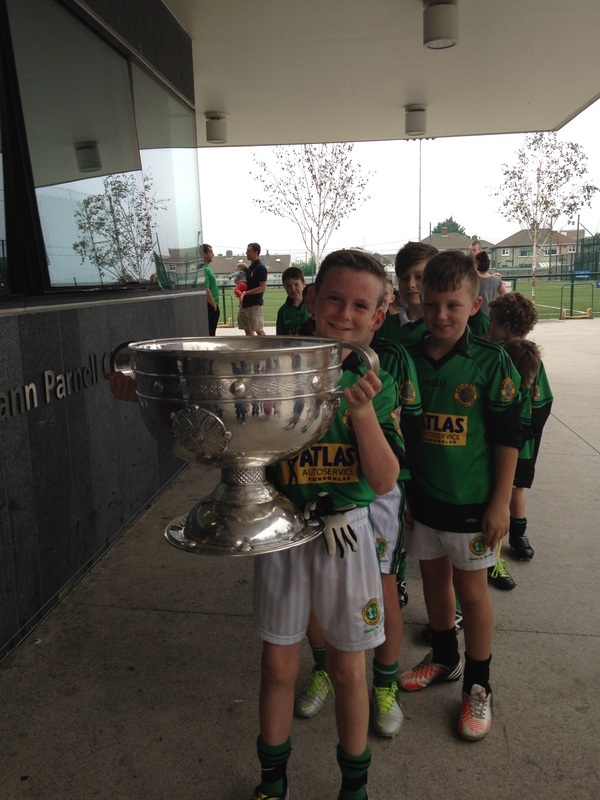 We first entered a boys team in the Cumann na mBunscol competition in September of that year and they really enjoyed playing against the other teams. 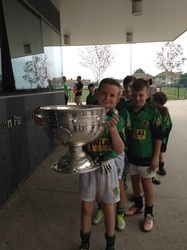 At this stage Pádraig Mac Grianna was on board helping Niall and with the addition of new portable goals the boys could now play 'home' matches. 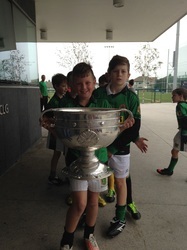 As well as taking part in Cumann na mBunscol we also played some friendlies with the neighbouring schools and the boys that took part really had great fun. In 2012 Pádraig took charge of the football and we formed a girls team for the first time. We now had two teams playing in Cumann na mBunscol competitions and the football was going from strength to strength under Múinteoir Richard who is managing the boys team and Múinteoir Alison who is managing the girls team since 2013. 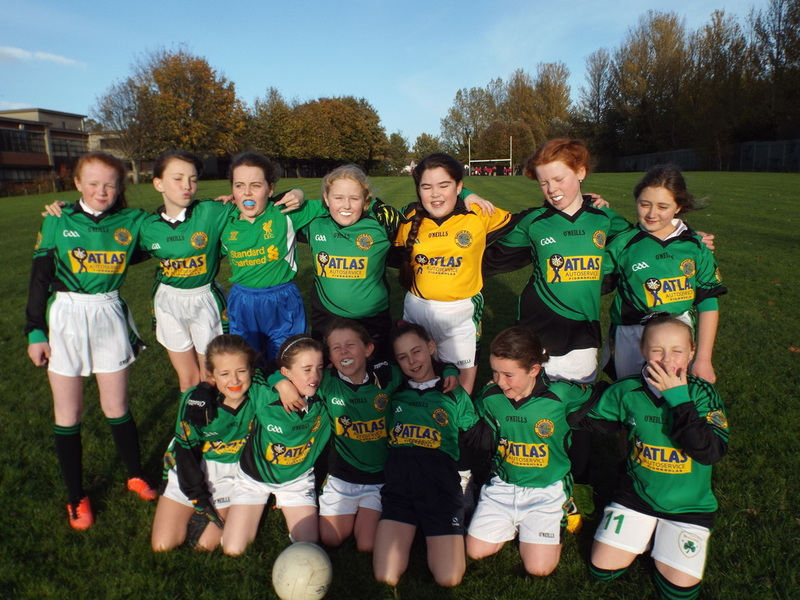 This year the girls took part in 'Corn Tadhg Ó Cionnaith while the boys played in the 'Go Games North 6' section. Based on the numbers who expressed an interest in football at the start of the year it was decided that the football for the boys would be for 2nd class to 6th class and that the girls would be from 3rd to 6th for this year. Visit to Parnell's GAA Club and a certain Sam Maguire!